What h as the world come too? 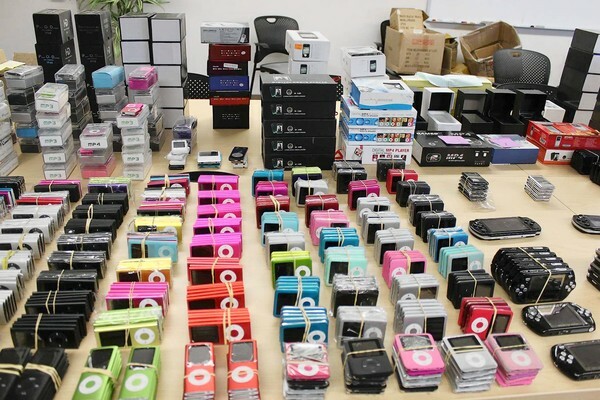 Fake iPods, iPhones, and iPod touches that were brought in from Asia have been sold and bought around the CES this past year. Police from the port of os Angeles have seized over $10 million worth of counterfeit Apple device from a warehouse. Many sellers have been selling them around certain parts of California, but the police are not sure how much further they have gone. Many customers have bought these fake iPod’s for cheap, but not cheap enough to raise awareness about them. Cops have reported that they have found receipts along with other stolen and counterfeit items bringing in about $7 million in profit. Customers have said that these iPod’s look extremely real until you turn on the screen. Customers have been allowed to touch and feel the product, but were not allowed to turn the product on. I would think that if you can’t turn the product on, wouldn’t you be suspicious? So far, two brothers have been arrested, and the two of them face total of four felony counts for the sale of counterfeit goods. The seizure was a result of an ongoing stolen cargo investigation that has been going on around Los Angeles and Vernon, CA late last year. I would think that there are many other sellers out there that are selling more counterfeit products. Apple has been a huge success, but with success comes fake products and people that take advantage of the poor economy. Not that many people can afford a $200 piece of technology these days. Whenever they find the product for a really good deal, of course they are going to jump on the opportunity. I don’t blame them either; I would want an iPod touch really badly after seeing many people on busses playing with them. How far would people really go in order to make money? Is it really worth it to make these counterfeit items, but also knowing that at any moment, you can get caught? Let us know, drop a comment below.